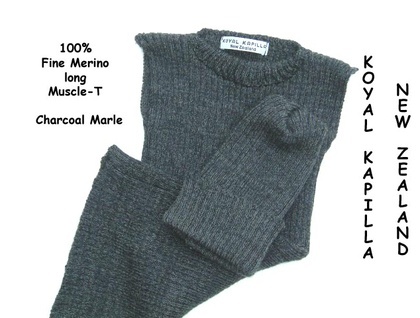 Introducing 100% Fine Merino Charcoal Marle knitted baby "Muscle-T" vest dress & matching beanie / hat. Exremely Soft & warm luscious fibres with a lovely handle. This is a new design of knitted "Muscle-T" that kind of works like a long singlet dress. It is 2x2 rib formation that molds to baby's body with a nice snug fit, extremely stretchy and comforatable to wear with an easy to use neckline. Best worn against the skin or in winter with a long sleeve buttoned up body suits. Can also be worn on top of other garments such as t shirts, tops, dresses having the layered look for winter. Approx size: Very Generous newborn up to 9 months depending on baby. It is extremely stretchy in the width, stretches and molds back to fit baby. Muscle-T measures: approx 18cm wide, 45cm length. Beanie / hat can be folded up or down to decrease the length, to help fit baby's head & age. The 2x2 rib formation is extremely stretchy with out being too tight. This is designed for comfort. Fine MERINO fibres are best for babies / toddlers. Combined postage - 2/3blankets depending on size in A4 Courier Post bag at $6.50. It will be a bit squeashed. Request for colours can be made. Any questions and feedback is most welcome. Please see my other listings.Thank You.